Sure to be knocked over with rambunctious kids in the house! "Bobby look what you did!" "Sorry, ma!" I used to use one of 'em to support my laptop. A fabulous treat as a deviation from our usual kitchen table routine ! Our set had wonderful geometric designs and I still miss them. 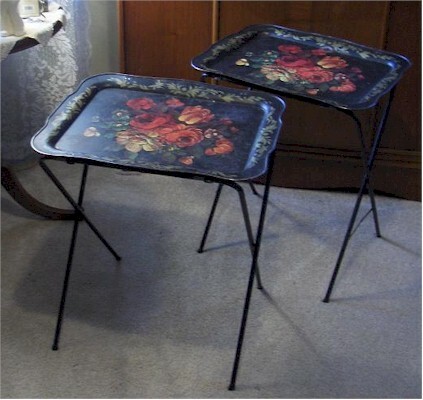 TV tray tables for TV dinners. The family would sit in front of its only TV in the living room and watch TV (Gun Smoke, Bonanza, etc) and eat dinner. Oh yes - never worked - they were so shaky - tipped over at the littlest of movement.